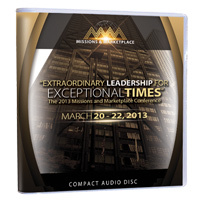 You don’t have to wait for the conference to order your copy of the 2013 Missions and Marketplace conference compilation! Relive all of the life-changing moments and study the success strategies shared by at all of the keynote addresses from the conference. Speakers include: Conference host Dr. Bill Winston, influential global and spiritual business leader, author and Founder and Pastor of Living Word Christian Center (LWCC), a 20,000 member church located in Forest Park, Illinois. Bishop T.D. Jakes, charismatic leader, visionary, entrepreneur and senior pastor of The Potter’s House, a global humanitarian organization and 30,000-member church located in Dallas, Texas. Dr. Steve Perry, author and regular education contributor for CNN, MSNBC, and Fox. Keith Cameron Smith, best selling author and inspirational speaker. Dr. Pat Francis, gifted author, television host and United Nations Representative who deals with humanitarian issues and systemic poverty in partnership with world leaders. Dave Steward, philanthropist, author, Chairman and Founder of World Wide Technology (WWT), a market-leading systems integrator and supply chain solutions provider that generates annual revenues exceeding $5.1 billion. Rev. Samuel Rodriguez, President of the National Hispanic Christian Leadership Conference, America’s largest Hispanic Christian organization with 40,118 member churches.